We depart at 7:30 am from the Berraco del Madidi office, in Rurrenabaque. Traveling by motor boat on the Beni and Tuichi Rivers, we enter into the Bolivian Amazon's Madidi National Park, one of the most biologically diverse regions in the world. Along the Tuichi river we will observe the caimans sunning themselves themselves on the banks of the river and macaws flying through the treetops. After 4 hours of scenic travel, we stop for a picnic lunch on the river bank. Continuing on our journey, we will arrive at the EcoCamp Berraco del Madidi in the early afternoon. Once at the camp, each guest is assigned their private traditional Quechua Tacana built hut immersed rainforest. Each hut is fully equipped with a tent, bed, clean sheets, towels, blankets and a hammock, table, and chairs. Our rustic camp is ideal for total immersion in the Amazon and as we have not cleared the surrounding trees, there is a great chance of spotting wildlife – including tapirs and peccaries – from the comfort of your hammock! After a snack in the dining room, we take a short hike on the Salitral and Mapajo Trail to learn about different species of plants and animals found in the primary rainforest. Primary forest refers to pristine forest that exists in its original, untouched condition. This forest has been relatively unaffected by human activities and contains the oldest trees. These giants trees, like the Mapajo and Ceiba, create a full canopy, allowing very little light to penetrate to the ground floor. Primary rainforest is the most biologically diverse type of forest in the world. Following the dinner buffet, our guide leads a night hike along the Real Palma Trail. There is no better place to immerse yourself in the sounds of the rainforest and discover nocturnal insects and animals like tarantulas, frogs, and Kinkajou screaming monkeys. After the breakfast buffet, we set out on the Playon Trail to learn about medicinal plants and the wide variety of exotic birds inhabiting the area. Along the trail, you may also encounter howler monkeys, poisonous snakes, and other rainforest species. Once we reach the nature viewing platform, we wait for the hordes of wild jungle pigs that frequent the nutrient-rich clay lick below. Perched right above the action, the platform provides great photo opportunities for our guests. Following the lunch and siesta, the guide leads a traditional fishing trip down to the Tuichi River. Using local fishing tools and techniques, guests are invited to practice the helicopter-like casting method to reel in the huge fish that inhabit these waters. Giant piranha (Pacu) and catfish are among the most numerous. Our fishing excursions are catch and release only to ensure the sustainability of our enterprise. Following breakfast buffet at the Berraco EcoCamp, we embark north on the Tuichi River towards the Quechua-Takana indigenous community of San Jose de Uchupiamonas. After the picturesque 3.5 hour boat ride, the village is just a 25 minute hike away. Once there, we will take a hike around the village and learn about the community’s three-hundred year history. On the tour, you visit the church, the school, the town hall and the small medical center. Locally made traditional crafts are on sale. At lunchtime, our guests enjoy a traditional meal in the home of a local family. After lunch we head back to the river and begin building the rafts that will carry us back down the river to camp. The 5 rapids on the Tuichi River range from Class I-III, depending on the season. We offer a very safe whitewater experience, with plenty of gentle flats between the rapids to take in the breathtaking Amazonian scenery. There are plenty of opportunities to view animals along the banks or take a break to swim in the river if the heat gets too much for you. The rafting experience lasts about 3 hours and ends near the EcoCamp, where dinner will be served. In this day program our guides give a brief tutorial about the rafting equipment, safety and technique. We head to the Tuichi river and start work on the rafts. The 5 rapids on the Tuichi River range from Class I-III, depending on the season. We are happy to offer a very safe and family-friendly whitewater experience, with plenty of calm water between the rapids to take in the breathtaking Amazonian scenery. There are opportunities to view animals along the banks or take a break to swim on a hot day. 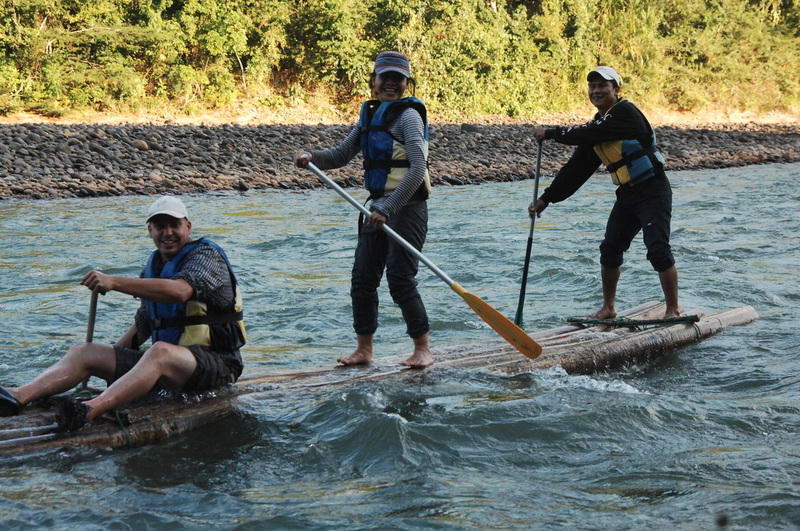 The raft journey lasts about 3 hours and ends near the EcoCamp.